Empire Technologies is your number one source for everything that you need in terms of business networking, security systems, CCTV, and more. 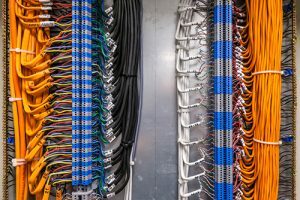 If you are hoping to find out more about commercial building CAT 5 cabling installation in Rancho Cucamonga, you will see that we will provide you with the quality work that you deserve. Our staff at Empire Technologies will be available to assist you with all of the wiring services that you are looking for at your commercial space in Rancho Cucamonga. These cables are some of the most recognized throughout the industry today and you may be familiar with the design. This is the standard in the industry and you can count on us to give you the replacement or installation that you are hoping for to get your business up and running from a networking standpoint. As with a lot of networking tasks, taking care of your CAT 5 cabling at your commercial location is something that is better off left up to the professionals. This is a form of wiring that has been released as a way to improve upon both performance-level as well as speed for computer networks. Using this cable is always recommended for a business that wants to have streamlined access to the internet without the worry of lagging or security problems. In order to learn more about commercial building CAT 5 cabling installation in Rancho Cucamonga, please give us a call today at Empire Technologies at (714)422-0431. We will be happy to send someone out to your location as soon as possible to do a consultation and then give you a detailed estimate for the work to be done.